I think if something happens and we can Mohl, our next coach has to be one with a strong background in pitching. NEW ORLEANS, LA., April 13, 2019 – The USF baseball team had 14 hits, but dropped Saturday’s slugfest to Tulane, 20-11. The Green Wave (24-11, 6-2 The American) were down to two outs with the bases loaded in the bottom of the fifth, but plated nine runs to take a commanding 14-4 lead. In the top of the seventh, the Bulls (15-18, 2-9 The American) had two men on with two outs, as Garrett Zech (Naples, Fla.) singled to score Jordan Santos (Tampa), making it 14-3. Nick Gonzalez (Tampa) ripped a single off the left field wall, plating two, then Kyle Phillips (Orlando) hit a three-run blast. USF would plate seven in the frame, as it had 13 at-bats during its own two-out rally. The nation’s home run leader, Kody Hoese opened the bottom half with solo home run to ignite a six-run frame. Tulane batted around as well to regain control, 20-11. Tulane grabbed a first inning lead with a two-run homer. The Bulls got one back on a Santos RBI single up the middle, scoring Phillips. The Green Wave plated three in the bottom of the fourth, but USF answered thanks to a Joe Genord (Lake Worth, Fla.) three-run homer to left, making it 5-4 heading into the bottom of the fifth, which was ultimately the difference. 14 – USF had 14 hits, the 11th time with double-digit hits this season. 11 – Genord’s 11th home run of the year and 42nd of his career. 3 – Phillips, Santos and Jake Sullivan (Tampa) all had three hits and two runs apiece. Genord is in third place on USF’s all-time list with his 42 career homers. Freshman Alex Bello (Miami) extended his hit streak to eight games. Senior Chris Chatfield (Riverview, Fla.) had a double, extending his hit streak to six games. 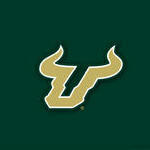 The Bulls and Green Wave conclude series Sunday at 2 p.m. Alec Wisely will be on the mound for USF. Moot point, all of the scoring happened after the 4th inning. I don't know how you guys feel about it, but when the USF Baseball team (and Tulane) pay homage to the Spring Game by putting up football-like numbers in every frame, I like 'em even more. With that kind of near-precision, we can do anything we put our minds to. Of course, the one slip-up was by the Bulls. Tulane did their job.